There are causes, from a driver distracted by being on a call (hands free or not), to roadways improperly designed and not properly separating cyclists and vehicles, to people disobeying traffic regulations around speed and proceeding at intersections. When we call road collisions “accidents”, we step away from anyone having any responsibility, and any urgency to make the changes in behaviour, laws, and environment that will lead to fewer deaths and injuries on our roads. That urgency is the lifeblood of Vision Zero, the international movement dedicated to eliminating serious injuries and deaths on our roads. Parachute’s Director of Communications and Marketing, Kelley Teahen, worked with our partner Media City to develop the campaign, which features an image of the now-too-familiar roadside memorial of a bouquet tied to a roadside lamp post to mark the spot where someone was killed. “This was not an accident,” the text says. “Find out why.” The URL leads to the Parachute Vision Zero website. Media City, a Toronto-based Outdoor Digital advertising company, has donated digital billboard space over four months – June through September – for the campaign throughout Ontario and Alberta. Astral Media has donated digital billboard space and “pillars” – urban street-level advertising plinths – in the City of Montreal for the same four months for the French version of the national campaign. Thanks to the generosity of Media City and Astral Media, our campaign is being seen widely across Canada. In June alone, the Media City billboards garnered 10.8 million media impressions and the Astral billboards had 9,958,149 impressions, for a total of more than 20 million from both donors combined. We will be taking the same images and messaging and promoting them widely on social media in the summer and through our web page. If you see one of these billboards anywhere in Canada, snap a pic and share on Facebook, Twitter or Instagram. Make sure to use the hashtag #ParachuteVZ and let us know @parachutecanada. 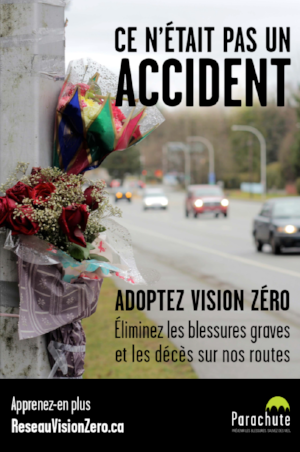 You can also sign up to be part of our Vision Zero network and receive regular updates and information.